Will future homes feature built-in recycled water systems? SAN DIEGO -- A small group gathered on a recent afternoon outside a $1 million model home on Cloudbreak Lane here. The five-bedroom house offered a Mediterranean tile roof, teal-green shutters and arched entryway. Designer touches inside included a walk-in pantry, motion-sensing faucets and optional oversized wine cabinet. But it was a plain, gray metal box on the side of the house that grabbed the most attention. Avery Kintner, a green building consultant, brought a group of students from University of California, San Diego, to see the box's secrets. The 5-foot-wide container held pipes, filters, a tub and other mechanics. It's a system designed to help the future residents of this house survive the ongoing drought and any future ones. The structure takes leftover water from the house's showers, sinks and laundry and filters it, then returns it to irrigate the front landscaping. The complex under construction, a development from KB Home called "Sea Cliff" is the first in the state built with so-called graywater piping in all houses. Kintner said he's been waiting for years to see this in the parched state, which is now in it's fourth year of drought. "This is one of the most exciting developments I've seen in California in a long time," Kintner said. He said that five years ago he was asking, "Why are we even building another building in California that isn't dual-pumped?" Sea Cliff is not on the sea, sitting about 14 miles east of the Pacific Ocean. It eventually will have 92 houses, all with recycled water. KB Home since early last year had been working with graywater system maker Nexus eWater Inc., a company born in 2009 in Australia during that country's millennial drought. Even then, Nexus eWater was eyeing California as its next market, said Tom Wood, the company's chief technology officer. 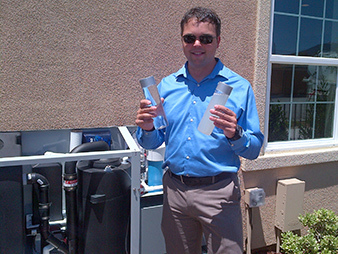 Tom Wood, Nexus eWater chief technology officer, shows graywater after and before filtering (l to r). Photo by Anne C. Mulkern. "The drought is built in" to the Golden State, he said. "Everyone here lives in the desert, essentially." Southern California relies on water transferred from the northern part of the state and Colorado, he added. "If Southern California's going to continue to grow, things have to change here," Wood said. Building homes with graywater piping in the Golden State is overdue, said Lester Snow, executive director of the California Water Foundation, an advocacy group. "It's incredibly significant," Snow said. "We are headed into a water future where supplies are more vulnerable than they've been in the past. "You jump ahead 20 years, and this is going to be more the norm than the exception," he said. Graywater piping and recycled water are being talked about in the building industry, the environmental community, the state's Legislature and Gov. Jerry Brown's administration. Brown in April declared a drought emergency. California then expedited advances to its Model Water Efficient Landscape Ordinance, which guides homes' outdoor designs. A rule approved last month limited green lawn sizes and restricted a new home's "water budget" for outdoor use (Greenwire, July 16). The change stopped short of requiring graywater piping. But it included an incentive to use recycled water outside. The measure allows landscapes less than 2,500 square feet irrigated solely with graywater or captured rainwater to meet a simple irrigation system checklist and avoid following the entire ordinance. That means people buying in the Sea Cliff project potentially could add larger lawns, Wood said. Meanwhile there's legislation, A.B. 585, from Assemblywoman Melissa Melendez (R), that would give tax credits for outdoor landscaping irrigation systems that exceed compliance with the new rule on outdoor water budgets. "This is the first time that I've actually seen a tax credit in California for something related to reducing your landscape water use," said Bob Hitchner, chief marketing officer at Nexus eWater. Right now, there's still a lack of knowledge about graywater systems, Hitchner said. He finds himself having to explain to people in Sacramento that treated recycled water can be sprayed on some edible plants outside, or piped into the house for use in toilets. "The understanding is not yet lined up with the state of the technology," Hitchner said. The hope is that language outlining standards for graywater piping will be added to the state's green building code in future years, Hitchner said. That code is not mandatory, however. "But it would help to establish how these homes should be built," Hitchner said. 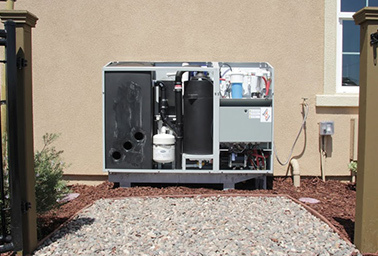 Graywater technologies bloomed as KB Home was spotting early drought conditions, said Jacob Atalla, the company's vice president of sustainability. The developer already had been adding water-saving appliances for several years. KB Home and Nexus eWater in 2014 teamed up to work on prototype projects showing recycled water inside demonstration homes. At the same time, the state adopted a standard dictating the quality that finished graywater must meet. Then events collided in a way that benefitted Nexus eWater. The company in April was certified by standards group NSF International to begin installing its systems, an approval seal mandated by California's building code. That same month, Brown declared the drought emergency and mandatory 25 percent water conservation. Two months later, KB Home broke ground on the San Diego homes, moving forward with Nexus eWater as a partner. "The timing came together pretty well," Wood said. In addition to the internal pipes in the Sea Cliff homes, two underground tanks hold water before and after it's treated. Those are covered with purple lids while bark chips used as landscaping hide a drip irrigation system. The graywater system adds about $10,000 to the cost of the home, said Ralph Petroff, chairman of Nexus eWater. That's part of 30-year mortgage, which is about $50 per month and less after factoring in tax deductions for mortgage interest, he said. Homeowners save money off their monthly water bills because they're using most gallons twice, he said. But Petroff added that the real "payoff" of the added piping can't be calculated financially. "They have the peace of mind of knowing they're going to have a permanent supply of landscaping, no matter how bad the water bans get," he said. The graywater system has attracted curious people to the homes, which is good for sales, said Craig LeMessurier, KB Home spokesman. "Buyers have been receptive to it," LeMessurier said. Nexus eWater's system has the ability to funnel graywater back into the house for use in toilets. KB Home opted for this development to stick with the narrower option of using the recycled water solely for outdoor irrigation, Petroff said. At least one home in the state has gone further. Nexus eWater recently finished adding a system to a custom home in Carmel, Calif., that uses treated water in toilets, Wood said. Graywater systems can also be put on existing homes, Petroff said. For a house with a crawl space underneath, it could cost as little as $3,000 to $5,000. On more complicated homes, he said, it could run $25,000. Others see the added cost of graywater -- even built in to new houses -- as impractical for many homeowners. KB Home's development houses start at about $900,000. At that price, the extra $10,000 isn't as noticeable, said Dave Cogdill, president and CEO of the California Building Industry Association. A gray box outside new San Diego homes holds part of graywater system. Photo courtesy of Nexus eWater. "When you're talking about that kind of money, you can incorporate these system into the home," Cogdill said, but it's different "when you're talking entry-level homes." In the state's Central Valley, a starter home for a family of four runs about $300,000 to $400,000, he said, and "it would be kind of a difficult thing for those markets to kind of absorb" the cost. Instead, many builders offer it as an option. But when homebuyers have a limited budget, he said, they're likely to spend it on upgraded cabinets or flooring. "We're finding that they chose a lot of other options before they go to rooftop solar or water systems like these," Cogdill said. That's likely to change as the technology becomes more popular and prices fall as a result, he said. Snow, with the California Water Foundation, said that if the drought continues, "what KB Home is doing in the development will just spread like wildfire." "I have no doubt that these folks are on the front edge of a wave of change in the way we do development," Snow said. The building industry supports adding purple piping inside new homes, Cogdill said. Those are pipes that can carry recycled water, he said, and it can be installed relatively inexpensively. A graywater recycling system that treats the liquid could later be added more easily if the homeowner wanted to pay for it. Cogdill also noted that new homes -- even without graywater piping systems -- consume about half as much water as homes built prior to 1980. There need to be more incentives to help homeowners of older buildings switch out toilets, shower heads, faucets and laundry equipment. That can be done for about $1,500, he said. "Programs like that, we think, could go a long way at conserving a lot more water," Cogdill said.